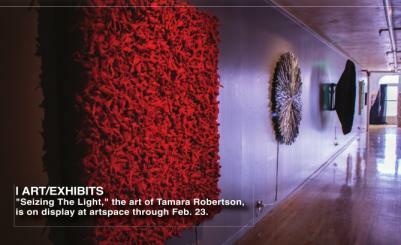 THROUGH MARCH 31: LIFE AND LEGACIES. This dual show features the legacy of Ed and Carol Allen paired with the reflection of life of Julia Raring. Bossier Arts Council, 630 Barksdale Blvd., Bossier City. Visit www.bossierarts.org. 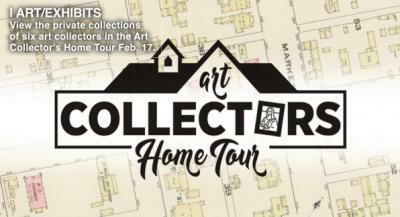 FEB. 17: ART COLLECTORS HOME TOUR. View the private collections of six home art collectors in northwest Louisiana. Self-guided tour tickets are $15 in advance, $20 day of the event. VIP SHuttle Tour includes private shuttle, drinks and appetizers, and a guided tour, $40 each or $75 for two. Noon - 5:30 p.m. Visit www.shrevearts.org. THROUGH FEB. 20: BIZ ART. 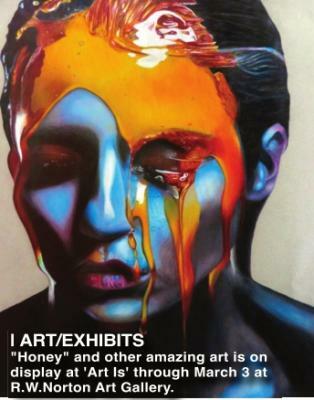 Featuring an exhibit from Hannah Wolfe, an abstract painter. Hayter Reynolds, 9045 Ellerbe Road, Ste. 103, Shreveport. Call 698- 3000. THROUGH FEB. 23: ON THE MARGINS. Artists Ben Moss and Jeromie Journell will paint largescale artworks directly on the walls of artspace for this new exhibit. Artspace, 708 Texas St., Shreveport. Visit the event page on www.facebook.com. THROUGH FEB. 28: BIZ ART. 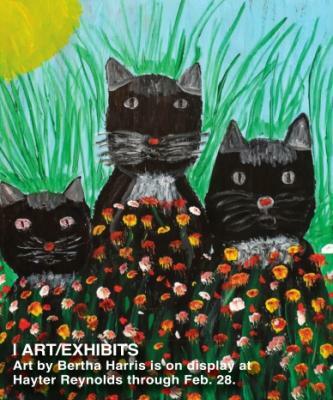 Featuring artist Bertha Harris, folk art painter. Artist reception is from 5-7 p.m. Hayter Reynolds, 9045 Ellerbe Road, Ste. 103, Shreveport. Call 698-3000. THROUGH MARCH 3: ART IS imagination, creativity, talent – making the unknown known the Norton presents submissions from high school and college students throughout the region. Ninety pieces were winnowed down to 24 marvelous works selected for the exhibition. R.W. Norton Art Gallery, 4747 Creswell Ave., Shreveport. Visit www.rwnaf.corg. 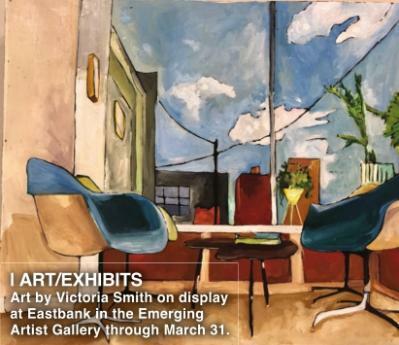 THROUGH MARCH 31: VICTORIA SMITH. In the Emerging Artist Gallery. 11 a.m. to 5 p.m., Tuesday- Saturday. Bossier Arts Council, 630 Barksdale Blvd., Bossier City. Visit www.bossierarts.org. AMERICAN LEGION #14: Karaoke with Jay Couger, or Dickie Turner 5:30 p.m. every Sunday; Easy Band, Feb. 15; Karaoke on Taco Tuesday, 6 p.m., Feb. 19, 26; Back Beat Boogie Band, Feb. 22. 5315 Lakeshore Drive, Shreveport. 635-8186. RIVERDOME: Scotty McCreery, 8 p.m., Feb. 15. Michael Bolton, Feb. 23. Horseshoe Bossier City Hotel and Casino, 711 Horseshoe Blvd., Bossier City. 800-895-0711. SUPERIOR GRILL: Live entertainment on the patio from 6:30-10:30 p.m. Jimmy Wooten Band, Feb. 13; Fine China, Feb. 14; Audubon Place, Feb. 15; Casey Martin Band, Feb. 16; Tambria Adams Band, Feb. 20; Scram Wulfie & Lefty, Feb. 21; Jason Sepulvado Band, Feb. 22; Rogers & Zaffater Band, Feb. 23; Professor Porkchop Band, Feb. 27; Savage Trio, Feb. 28. 6123 Line Ave., Shreveport. 869-3243. WHISKEY ROADHOUSE: Hours are noon to midnight Sunday; 6 p.m. to midnight Monday through Thursday; 4 p.m. to 2 a.m. Fridays and Saturdays. Karaoke from 8 p.m. to midnight every Tuesday. K94.5 Morning Madhouse Trivia with Know It All Trivia, Feb. 13, 20, 27. What the Funk? !, Feb. 14; Landon Bullard and Mostly Sober, Feb. 15; Southern Roots, Feb. 16; Sunday Funday with DJ Love, Feb. 17, 24; '90s Nite with That Girl DJ, Feb. 18, 25; After Hours, Feb. 21; David Joel, Feb. 22; Bayou Boogie, Feb. 23; Pseudo Boom, Feb. 28. Horseshoe Casino, 711 Horseshoe Blvd., Bossier City. FEB. 14-17: THE NINA VARIATIONS. This is an innovative take on a dramatic classic. $15, general admission; $10, military; $5, students. Marjorie Lyons Playhouse, 2700 Woodlawn Ave., Shreveport. Visit www.centenary.edu/mlptickets. FEB. 16: BROADWAY BELTERS ENCORE. Featuring Broadway star Laura Bell Bundy, a Tony Awardnominated actress and singer. $25-$35. 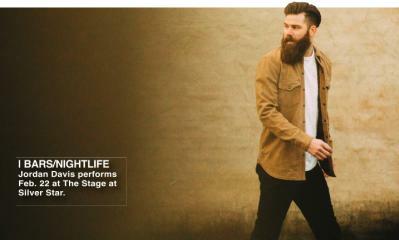 7:30 p.m. Shreveport Little Theatre, 812 Margaret Place, Shreveport. Visit www.shreveportlittletheatre.com. FEB. 21-24; FEB. 28-MARCH 2: SCHOOL OF ROCK. Stage Center presents with musical with music from Andrew Lloyd Webber and based on the hit movie that follows a failed, wannabe rock star turned substitute teacher who forms a band with his students. $20, adults and seniors; $15, students (in advance). 6 p.m., Feb. 21, 22, 23, 28, March 1; 2 p.m., Feb. 23, 24, March 2. Central Artstation, 801 Crockett St., Shreveport. Call 218-9978. FEB. 28, MARCH 1-3, 8-10: INHERIT THE WIND. This American drama is a portrait of an explosive episode in American culture. $20, seniors, students and active military; $22, adults. Shreveport Little Theatre, 812 Margaret Place, Shreveport. Call 424-4439. MARCH 09: THE OTHER MOZART. The forgotten story of Mozart’s genius sister, Nannerl. A dazzling one-woman show. $25.50-$42.50. The Strand Theatre, 619 Louisiana Ave., Shreveport. Visit www.thestrandtheatre.com. EVERY TUESDAY STARTING MARCH 5 THROUGH MAY: EAST BANK MARKET. A celebration of local vendors, handcrafted goods, artists, food and small business to include live music, fun family activities and more. 4-7 p.m. East Bank District and Plaza, 630 Barksdale Blvd., Bossier City. Visit www.EastBankMarket.com. FEB. 14: LOVE & LAUGHTER. Connect with other local singles for a fun night of speed dating, comedy and delicious food. $25. 6-10 p.m. Artspace, 708 Texas St., Shreveport. Visit www.artspaceshreveport.com. FEB. 14: THE EAST BANK CUPID CHALLENGE 2019. Bands are asked to write two original Valentine-related songs and perform live where the audience chooses a winner. Food trucks, artists and vendors, and live music. Free. 6-11 p.m. East Bank District & Plaza, 600 Barksdale Blvd., Bossier City. Visit www.bossierarts.org.B. FEB. 15: LOVE POEMS TO PLANET EARTH. An open mic poetry reading. All local poets are invited to attend and participate. 5-7 p.m. Centenary College’s Meadows Museum of Art, 2911 Centenary Blvd., Shreveport. Visit www.themeadwosmuseum.com. FEB. 15-16: GREEN THUMB SEMINAR AND PRUNING DAYS. Join local rose society members and fellow volunteers for pruning as well as a Green Thumb Educational Seminar. Free. Pruning is 8 a.m to 5 p.m., Feb. 15; 1-5 p.m., Feb. 16. Seminar is 8 a.m. to noon. The American Rose Center, 8877 Jefferson Paige Road, Shreveport. Call 938-5402. FEB. 16: MSGR. LACAZE LAGNIAPPE GALA. With buffet, silent and live auctions and more. This event is a memorial for Msgr. J Carson LaCaze and proceeds will benefit the Diocese Retired Priests Fund. $50. 5:30 p.m. Multi-Room of the Cathedral of St. John Berchmans, 939 Jordan St., Shreveport. Visit www.sjbcathedral.org. FEB. 16, 21, MARCH 2, 9, 6: ADULT ACTING CLASSES. With veteran director and actor Mary Joris. Develop acting skills, rehearse scenes from your favorite plays, sharpen acting skills, and perform scenes and take the stage in a showcase. $185. 11 a.m. to 1 p.m. Call 424- 4439. FEB. 16, 23 MARCH 2, 9, 23, 30, MAY 4, 11: ROARING WELLNESS – USING HERBS & SIMPLE PRACTICES FOR EVERYDAY HEALTH. A SUSLA class. $45. Metro Center, 610 Texas St., Shreveport. Call 464-8369. 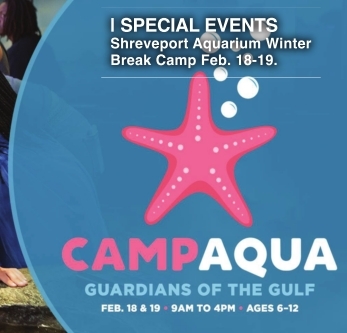 FEB. 18-19: SHREVEPORT AQUARIUM WINTER BREAK CAMP. In this two-day winter break mini-camp, budding biologists will learn what it’s like to be a “Guardian of the Gulf.” Lunch included. Ages 6-12. $95. 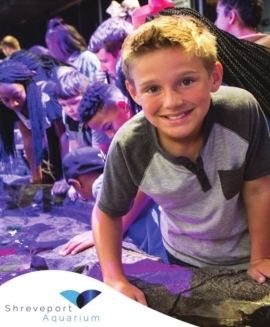 9 a.m. to 4 p.m. Shreveport Aquarium, 601 clyde Fant Parkway, Shreveport. Visit www.shreveportaquairum.com/camp. FEB. 19, 26: KAREN LABEAU FOLK ART PAINTING WORKSHOP. As part of the Shreve Memorial Library’s Black History Month programming, the workshops will explore cultural traditions and techniques used in folk art, while allowing participants to create their very own piece of folk art. 5 p.m., Feb. 19; 6 p.m., Feb. 26. Visit www.shreve-lip.org. FEB. 21: THE RED HANGER EVENT. An annual fundraiser for Dress for Success Shreveport-Bossier with fashion, food and fun. $75. 6:30-8:30 p.m. Sam’s Town Hotel & Casino, 315 Clyde Fant Parkway, Shreveport. Visit www.eventbrite.com. FEB. 23: THE ROBBYS. 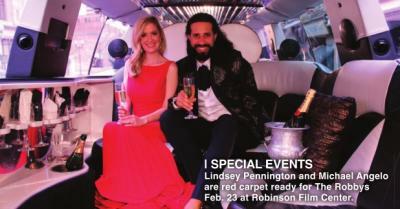 A red carpet party is a fundraiser for Robinson Film Center which includes food, cocktails and live music by Windstorm. $150; $125, RCF members. Robinson Film Center, 617 Texas St., Shreveport. Visit www.robinsonfilmcenter.org. MARCH 2: GOLDEN GATOR GUMBO COOKOFF & KREWE DE PROVENANCE MARDI GRAS PARADE. This family-friendly event is open to the public with a parade, king cake for sale, live music, photo booth and gumbo sample. $5, tickets for gumbo tasting. 10:30 a.m. to 1:30 p.m. Windrush Park, 2056 Bridgewater Ave., Shreveport. Visit www.facebook.com. MARCH 2: 7TH ANNUAL PROM DRESS GIVEAWAY. The Cinderella Project of Shreveport is hosting its annual dress giveaway where junior and senior girls will shop for a free prom dress. 9 a.m. to 1 p.m. Ayers Career College, 8820 Jewella Ave., Visit www.cinderellaprojectla.org/shreveport. MARCH 9: ARK-LA-TEX GENEALOGICAL ASSOCIATION MONTHLY MEETING. With guest speaker Rusty Beckham presenting “Remembering the Spanish Influenza Epidemic of 1918.” 1-3 p.m. Shreve Memorial Library, Broadmoor Branch, 1212 Capt. Shreve Drive, Shreveport. Visit www.altgenealogy.com. MARCH 9: ARKLATEX CRAFT BEER & BBQ FESTIVAL 2019. Experience the blending of two great American pastimes: craft beer and competition barbecue. With live music, games, a little bit of regional history, a 5K and a mile-long Beer Run! 10 a.m. to 6 p.m. Louisiana State Exhibit Museum, 3015 Greenwood Road, Shreveport. Visit www.arklatexcraftbeerandbbq.com. MARCH 11: INSPIRING WOMEN WEEK LUNCHEON. The luncheon features speaker Jill Browne hosted by Commission for Women of Bossier City. 11:30 a.m. to 1 p.m. Bossier Civic Center, 620 Benton Road, Bossier City. Visit www.eventbrite.com. MARCH 14: DESIGNER BAG BINGO. Featuring designer handbags as prizes with 10 games of bingo and an incredible raffle hosted by the Junior League of Shreveport- Bossier. 6 p.m. Horseshoe Riverdome, 711 Horseshoe Blvd., Bossier City. Visit www.jlsb.org. MARCH 16: POVERTY POINT MORNING HIKE. A ranger-led hike showcasing the mounds, earthworks and nature found in the park. Meet at the museum for a short video. Poverty Point, 6859 LA-5777, Pioneer. Call 318-926-5492. MARCH 22-23: CRAWFEST. The third annual event will include crawfish for sale, local vendors, hog roast, live music, local artists, kids' area and VIP area. Free admission. 4-10 p.m., March 22; 11 a.m. to 8:30 p.m., March 23. Betty Virginia Park, 3901 Fairfield Ave., Shreveport. Visit www.crawfestshreveport.com. APRIL 3: SPRING 2019 CAREER AND INTERNSHIP FAIR. Current students and alumni from all degree programs will be participating, and they will be looking to chat about part-time work, internships and full-time roles. $100, for-profit organization; $85, nonprofit organization fee. 10 a.m. to 1 p.m. LSU Shreveport University Center Ballroom, 1 University Drive, Shreveport. Call 797-5062. HARRAH'S LOUISIANA DOWNS: 8000 E. Texas St., Bossier City. 742-5555. Must be 21 years of age or older to participate. February Promotions: Return Rewards. Total Rewards Members that earn 100 Tier Credits in a day will receive at least $5 in Free Slot Play. Mystery Reward Credit Multiplier: On Tuesdays & Wednesdays Total Rewards members can swipe their card at the Promotions Kiosk to receive a Reward Credit Multiplier. Total Rewards members have a chance to win up to a 100X multiplier. Swarovski Gift Series (select Thursdays). On select Thursdays, guests must earn 100 Tier Credits to receive one gift each week. Earning period is from 6 a.m. to 7:30 p.m. Gift distribution is from 2-8 p.m. Lover’s Loot Drawings: Every Friday, Total Rewards members can swipe their Total Rewards card for a chance to win up to $200 in Free Slot Play. Activation is from 3-9:45 p.m. All Total Rewards members receive one free entry upon activation; additional entries are based on Tier. At 4 p.m., drawings will begin and happen every hour. Must be 21 years of age or older to participate. See Total Rewards® for details. Fuddruckers Special Earn 100: On Fridays and Saturdays, Total Rewards members who earn 100 Tier Credits can receive a complimentary meal voucher for a burger, fries and a drink at Fuddruckers (max value $20). HORSESHOE BOSSIER CITY HOTEL AND CASINO: 711 Horseshoe Blvd., Bossier City. 742-0711. February Promotions: Mystery Reward Credit Multiplier on Mon. and Tues., Total Rewards Members can swipe their Total Rewards Card for a chance to win up to a 100X Multiplier or a 3X multiplier for Video Poker. Guests can swipe their Total Rewards card at any Promotional Kiosk. Asian 3K Drawing: Asian Midweek Drawing. On Wednesdays, Total Rewards Members can swipe their Total Rewards Card to activate their entry into the drawing between 7-11:45 p.m. in the Mini Baccarat area. Drawings happen every 15 minutes from 8 p.m. to midnight. One winner will be announced to receive promotional chips, Free Slot Play or a Visa Card. Swarovski Gift Series. On Wednesdays, guests must earn 150 Tier Credits to receive one complimentary gift card each week. Earning period is from 5 a.m. to 7:30 p.m. Gift distribution is from 3 p.m. - 8 p.m. Suitcase Man Drawings. This giveaway is Legendary! Every Friday and Saturday Total Rewards members will receive one complimentary entry into the giveaway drawings. Total Rewards members can also earn additional entries for every 25 Tier Credits earned each day. Every 30 minutes from 6-10 p.m., winners will be announced for a chance to pick a suitcase and play it on the promotional craps table where they will either crap out and receive $100 in Free Slot Play or win and double the amount in their suitcase for a chance to win up to $100,000 in cash! 10X earning Select Sundays & Tuesdays. $8,000 Asian Mini Baccarat Tournament is now through Feb. 22. MARGARITAVILLE CASINO AND RESORT: 777 Margaritaville Way, Bossier City. 855-346-2489. www.margaritavillebossiercity.com. February Promotions. Continuity Game. Island-themed game with the appeal of more winners, more often where customers complete a collection of Island 1 before progressing to Island 2. Play N Get Mardi Gras Series is Monday through Thursday. 2X Play Wednesdays. Guests receive two free game plays. Paws in Paradise $20K Slot Tournament is Feb. 14, 21, 28. Top 15 patrons will win a share of $5,000 in free play. 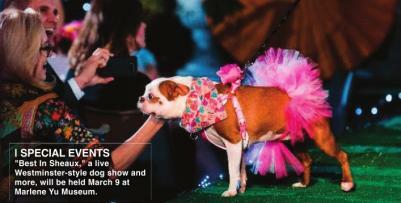 All proceeds go to local animal rescues who participated in Paws in Paradise Event. $50K Mini Baccarat Tournament Qualifier Drawings is every Sunday and Thursday. Four guests will be drawn for $200 in promotional chips, and one guest will be drawn for $500 in promotional chips and a guaranteed spot in the semi-final round of the $40K Mini Baccarat Tournament on March 3. $125K Heat is on Progressive Giveaway is every Friday and Saturday. Nineteen names will be drawn each night every 30 minutes. Final drawing is Feb. 23, where one lucky winner will receive $20,000 in cash. SAM'S TOWN HOTEL AND CASINO SHREVEPORT: 315 Clyde Fant Parkway, Shreveport. 811-429-0711. www. samstown.com.